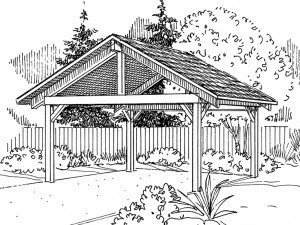 If you are looking for an economical way to add extra sheltered parking to your residence, consider this carport plan. Its 21’x14’ design easily handles two standard sized vehicles. A vaulted ceiling and simple design add to the appeal of this handy carport plan. You’ll appreciate having an extra 294 square feet of sheltered parking for your growing family fleet. 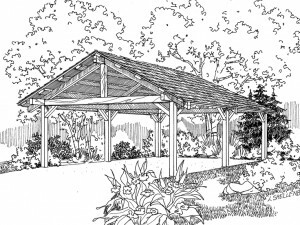 View this carport plan for more details. 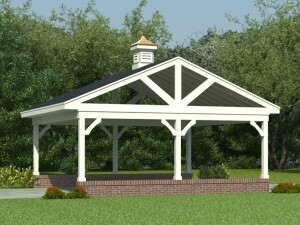 If you like The Garage Plan Shop’s carport plans, you might interested in our garage plans with carports as well. If you are in need of sheltered parking for one or two automobiles, carport plans offer an economical solution. Carports are designed to shelter one or more automobiles or other large items from the elements. In general, they are open-sided shelters on at least one or two sides and are designed for the purpose of protecting cars and other vehicles such as a camper or boat from the wind, snow, rain and sun. Carport plans, sometimes referred to as outdoor covers or sheltered parking, are very simple in design and display little detail and ornamentation. The main exterior finishes include siding, brick, metal and logs. Various sizes and styles deliver selection allowing you to find the right one to satisfy your needs and compliment your home. Sometimes, carport plans incorporate a storage space such as shelving, a small closet or cabinets at the rear or on the side of the structure. If you are looking for a less expensive alternative to building a detached garage, take a look at The Garage Plan Shop’s carport plans.